Here, the water safety experts at Legionella Control International take a look at issues surrounding the control of legionella in social housing. We consider how these risks can be managed effectively to ensure the safety of tenants, staff and contractors. We also review what steps are required to achieve and maintain compliance with the Health and Safety Executives (HSE) ACOP L8 dealing with the control of legionella and Legionnaires’ disease. Legionella bacteria are present in the natural world. However, they can also be found in man-made water systems (hot and cold water systems – taps, showers, tanks, water heaters etc. ), including those in social housing. Many newspaper headlines created around outbreaks of Legionnaires’ disease concern businesses, hospitals, and similar settings. Very few ever touch on the potential risks posed by inadequate management of legionella in social housing situations. Here, we touch on many of the most important issues surrounding the control and management of legionella in social housing locations. 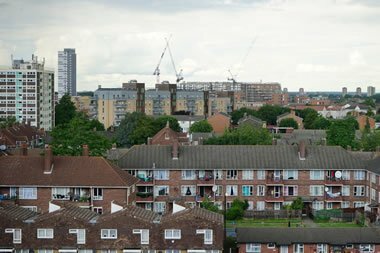 Who is a social housing landlord? Many people who think of landlords think about private residential properties rented out to private individuals. However, the term landlord can apply in many other situations too. Quite simply, anyone renting a room or an entire property to someone else is deemed to be a landlord operating a business and must comply with current health and safety law. The only exception to this would be if that person was renting part or all the property for longer than seven years with a full repairing obligation. This applies both in the public and private rental sectors. From an individual landlord renting out one house to someone renting rooms to numerous people within a larger property, many social housing situations are covered by this term. In the UK every landlord must ensure the property they are renting out (or rooms, if applicable) is safe for use. This includes assessing the safety of the water systems used in that building. Social housing must be fit for purpose and pose no danger to those staying there. The Health and Safety Executives ACOP L8 provides excellent guidance on what social landlords should do to ensure they meet all legal requirements regarding the control of legionella bacteria in their properties. This includes conducting a legionella risk assessment, and then taking suitable precautions to manage any risks identified in that assessment. The assessment should be reviewed regularly to ensure it is up to date at all times. Any changes to the water systems, management processes or to the property itself would require a review to determine whether the legionella risk assessment should be changed in any way. How important is the management of legionella in social housing? Effective management of the water systems in social housing is vitally important. If they are not properly managed, legionella bacteria may be given the opportunity to spread through the water systems and grow to unsafe levels, posing a danger to tenants, you and your staff, contractors and others. All properties are different – some may require more upkeep and maintenance than others. By considering all elements of the water system in the risk assessment, appropriate steps can be taken to ensure its ongoing safety. Some landlords will request legionella services from specialist firms such as Legionella Control International. However, they remain responsible for the maintenance and condition of the site… and the safety of its water systems. You can read more about the management of legionella in social housing in the second part of this article. Our teams of legionella and water safety specialists support those responsible for the control of legionella in social housing, helping them to protect public health and meet their health and safety obligations in this area. We deliver professional water safety risk assessments for legionella and other waterborne pathogens, water testing, independent compliance auditing, City & Guilds training and other environmental risk management services that help keep people safe. Here, the water safety experts at Legionella Control International take a look at issues surrounding the control of legionella in social housing. We consider how these risks can be managed effectively to ensure the safety of tenants, staff and contractors, and maintain compliance with the Health and Safety Executives (HSE) ACOP L8 dealing with the control of legionella and Legionnaires’ disease. Are Superbugs the Biggest Threat to Public Health?